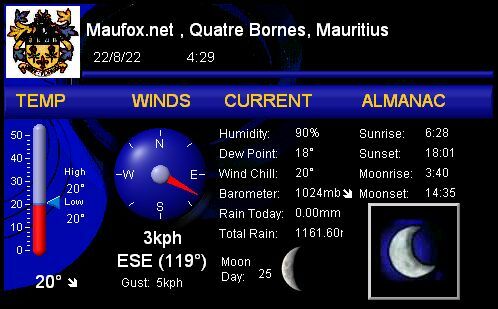 The objective of this page is to provide weather pictures from polar orbiting satellites for the south west region of the Indian Ocean and to give daily weather conditions of the town of Quatre-Bornes. Technical details for equipment required to receive pictures is also presented. The Aviation page has pictures of Airlines flying into Mauritius. If you have any suggestion, please e-mail me at maufox@intnet.mu. Copyright © 1999-2019 Maufox. All Right Reserved.